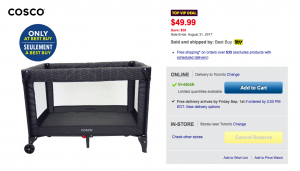 DEAL ALERT – Best Buy VIP Sale – Today Only – Cribs 50% off, and more! Best Buy is having a ONE day VIP Sale! 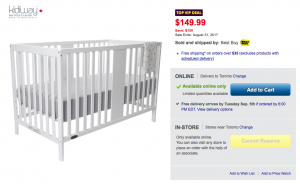 Selected cribs are 50% off today only. Have a look here. We personally bought this one at their precious sale and we love it! Simple and perfect. They also have a sale on various Baby items. We bought this playpen and its perfect for our needs! Great deal!